Although Walter D Brown recorded as a solo act as well as in partnership with Lola Grant I’ve always felt his best work was with her attractive young sounding high pitched voice off setting his clear tenor vocals. Judging by the releases on Shurfine and Josie the sessions included both solo sides and duets, with the songs provided by the singers themselves. Brown’s flexible voice was well to the fore in his first singles for Wendell Parker’s Atlanta based Shurfine label, the lively "Bad Habit" and “Don’t Worry ‘Bout Me”. This ballad combined tinges of doo-wop with gospel overtones in a rather attractive fashion, illuminated with some good falsetto phrases. 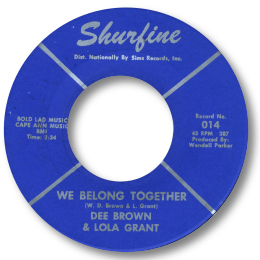 We Belong Together is a similarly paced ballad with a good melody, but like Brown’s solo effort was obviously a small label production. 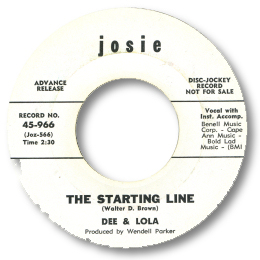 The sides that Parker was able to place with Josie were better songs and had a punch to the arrangements that was lacking in their earlier releases. “Love Love Love”, written by Brown, had the benefit of a horn section and some fine chord changes, but the pick of these early efforts was the excellent The Starting Line, a deep soul cut which featured a good rap from both singers and a helpful chorus giving the song depth and vigour. And that was the sum of the duo’s known recording career until 1978 when P-Vine in Japan released an LP with 4 previously unreleased tracks. These were a revelation being far higher quality than their singles. Partially this was down to better material, but mainly to the impeccable playing of the AGP session guys and the higher production values that Chips Moman was able to bring to the sessions. “Punch A Hole In Our Love” was good, and their version of “Do Right Man” rather touching in it’s sincerity but the other two cuts were sensational. Let’s Do It Together and their rendition of the Jennings Brothers Believe In Me were southern soul of the highest class. Lola brought a freshness of approach and almost teenage sensuality that was absolutely charming and Brown’s straight forward delivery and harmonies added greatly to the effect. Check out Reggie Young’s lovely fills in this one as well. From their sound I’d guess these tracks were cut around 1968. After this Lola seems to have retired but Brown continued on his own, cutting a session for Hoss Allen in Nashville in 1971 that yielded a 45 on Jewel. “Heap Of People” is a decidedly downbeat song of considerable power. Interestingly all the songs feature prominent female vocals - Brown may have that known that his voice was best suited to that form of expression. 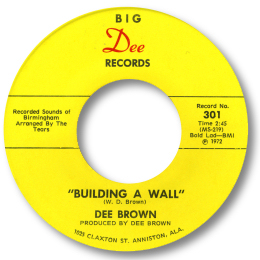 In the 70s Brown started his own Big Dee label from his Alabama base, recutting “More ”as well as recording other artists like Bill Avery who also sang as the lead singer of the Thrilling Dynamics. You can hear this group's version of "We Belong Together" here - thanks to Ben Cohen for spotting the link. 1. The unissued AGP sides - "Do Right Woman", "Let's Do It Together", "Punch A Hole In Our Love" and "Believe In Me" were released on P-Vine Japan’s “From Atlanta To Birmingham” album. 2. “Heap Of People” can be found on the Westside UK CD “Soul Jewels Vol 2”, and on the Road US CD “Nashville’s Got The Beat” which also features the recuts of “Bad Habit” and “Love Love Love” from the same session. 3. "We belong together" can be found on the SPV CD "The Rich Records Story - Music City, Motor City & The Big Easy". Thanks to Bill Cornell for this extra info.